Pasta lovers will be pleased to know that there is a National Pasta Month and it is happening this month of October. Last Saturday, Dona Elena Al Dente Pasta hosted an event that showed us how to make the most out of this pasta appreciation month. 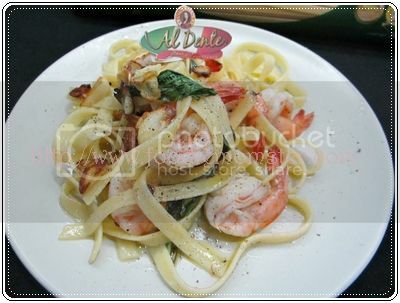 The event has all the ingredients to recognize the value of pasta in gastronomy. There were informative talks about the health benefits of pasta, a cooking demo by Chef Michel Cottabaren, and a cook-off with some of the bloggers. 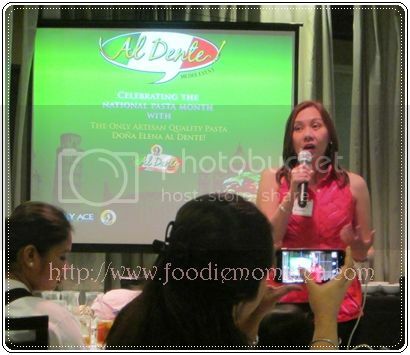 RJ Ledesma also shared his pasta experience and how he started Mercato. The speakers filled us with a lot of interesting tidbits about pasta. My first tidbit is – there is good pasta and there is excellent pasta. 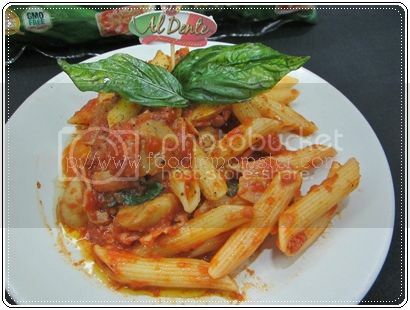 Those who want nothing but pasta cooked al dente can find the real deal in Dona Elena Al Dente Pasta. 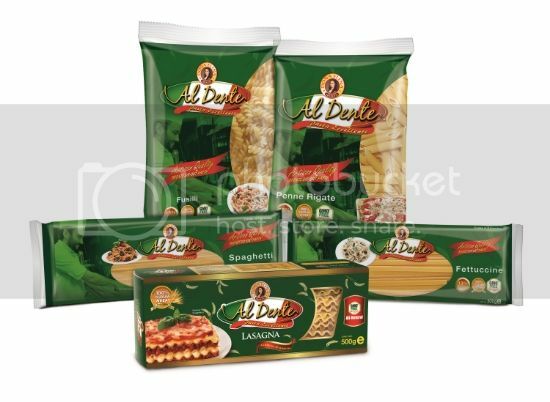 It is the only Artisan Quality Italian pasta brand in the country and is made from 100% Durum Wheat Semolina. This pasta is subjected to slow drying instead of high heat which means that more food nutrients are preserved compared to pasta cooked in high heat. Quality pasta from durum wheat semolina has more fiber, less starch, and higher protein than regular pasta. I always thought of pasta as pure carbs so it was pleasant news that Dona Elena Al Dente Pasta actually has 13% protein content. That is more than double of the protein content from local pasta which is just 6%. As for those who love to cook and eat pasta, it pays to check the die used for your pasta. Traditional pasta from Italy makes use of special bronze dies that create ridges on the pasta. These ridges help you make pasta more delicious because it allows the sauce to cling better to your pasta. 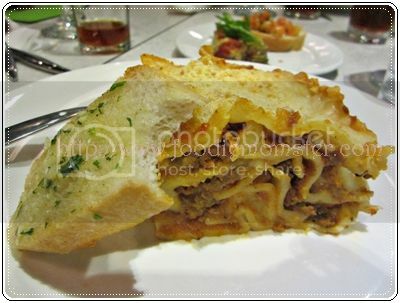 Gourmets will not be disappointed too, as the added texture of bronze die-cut pasta adds to the gustatory experience. Oh and I got an interesting cooking tip too. I just discovered that you don’t need to put oil on your pasta when you boil it especially if you are using quality products like Dona Elena Al Dente Pasta. Learning about these things already gave me a better appreciation for pasta but the Dona Elena media event has more to offer. The cooking demo by Chef Michel Cottabaren of The Blackboard and cook-off challenge inspired me to try new pasta recipes using Al Dente Pasta. Fusilli, Fettuccine, and Penne Rigate variants of the pasta were used for the demo and the challenge. We got to try some of the dishes prepared by Chef Michel and I just love the Fettuccine with Shrimp in olive oil and the Lasagna. Other flavorful dishes served during the event include the Penne Rigate with bacon and mushroom in tomato sauce, roasted eggplant with pomodoro sauce, and panna cotta. Celebrating the #NationalPastaMonth with Dona Elena Al Dente Pasta was a very filling experience. I got loads of information about pasta and the benefits of choosing Artisan Quality Italian Pasta. 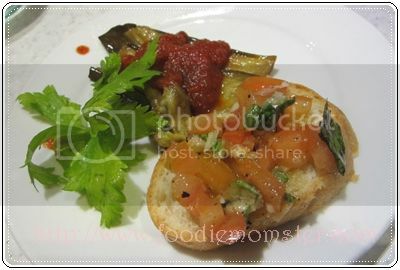 The recipes and delicious pasta dishes that we got to try were added bonuses from the event. Good quality and healthy pasta is definitely worth celebrating. Enjoy this month long event by exploring different flavors, recipes, and variants of your favorite pasta. Just remember, if you want to celebrate the goodness of pasta, then there is no better way of doing it than #AlDentePasta !